Erik Hansen and his son Olin. Last month, I attended the Global Climate Action Summit (GCAS) in San Francisco—the largest climate event ever held in the United States. It was a tremendous moment where leaders from states, cities, businesses, non-governmental organizations, and investors gathered to take action on climate change. 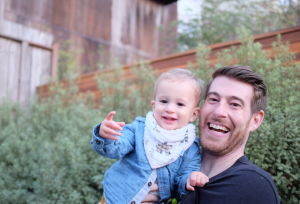 When I think about what will make the world a better place for my son and what I’m most excited about from a sustainability perspective, there are three things that came out of the GCAS that I’m excited to share. Workday joined the Step Up Declaration. Alongside 20 tech companies, we’ve joined a coalition of organizations to harness the power of technology to reduce greenhouse gas (GHG) emissions and ensure a climate turning point by 2020. We’ve committed to set an internal price on carbon that will align our investments to accelerate the transition to a low-carbon economy, and continue to provide our customers around the world with a carbon-neutral cloud. The Step Up Declaration is modeled after the Paris Agreement, where each company contributes its own meaningful commitments that aim to inspire others to take action. We discussed the role of forestry carbon offsets and corporate sustainability. At Workday, we invest in high-quality carbon offsets, including forestry projects, to help bring us closer to meeting our net-zero carbon emissions goal. At the event, we participated in a panel organized by Natural Capital Partners alongside Microsoft (another company that utilizes an internal price on carbon to meet its sustainability goals), several carbon offset project developers, and Verra, one of the carbon offset standard-setting bodies. Each panelist stressed the importance of forestry projects that not only result in GHG emissions reductions, but also provide co-benefits for local communities such as increased economic opportunity, food security, and better health and wellbeing outcomes. We celebrated California Governor Jerry Brown signing SB100, a bill that sets a goal for 100 percent carbon-free energy in the state by 2045. With our global headquarters in Pleasanton, Workday joined other California-based businesses in signing a letter of support in alignment with our commitment to 100 percent renewable electricity. It was a great event, and I’m thrilled by the bold new goals and commitments announced that will have a meaningful impact to address climate change. Together, we can step up and leave the world a little better than we found it.